The AFSPA (armed Forces Special Powers Act) debate in this country has recently been ramped up by many decibels. There appears to be a concerted campaign on the part of some foreign funded NGOs to demonize the army and delegitimize it's counter insurgency and counter terrorist operations. It must be remembered that the army is the instrument of last resort of the state and it has successfully tamed insurgencies in the Northeast and various tourist movements in Punjab and Jammu and Kashmir. It is brought in only once the local police and Central and police force have failed to control the situation. Its operations have to be within a legal framework which sets the rule of engagement and also provides basic protection from prosecution (as available to the police under section 45 and 197 of the CRPC) for personal acting in good faith. This is precisely what power Act does and hence is a critical enabling legislation. It was enacted in September 1958 and has stood the test of time in its operation over the last 6 decades. There is a concerted campaign that seeks to label this act as draconian. In reality it contains the bare minimum powers essential to deal with a highly militarized and well I'm terrorist and insurgent Groups with extensive foreign support and sanctuaries. The scale of militarization of current internal conflicts is not generally understood. In Jammu and Kashmir alone the Indian Army has since 1990 recovered over 80000 AK Series Rifles over 1300 machine guns over 2000 rocket launchers, 63000 and Grenades and 7 million rounds of ammunition. This is no peaceful civil protest It has done Jammu and Kashmir into a virtual war zone. Are aware that since 1990 the Indian Army has lost 5108 officers,JCO and Jawan fighting Pakistan proxy war. The army conducted consulted operations and eliminated over 20000 terrorist a large proportion of whom were foreign terrorist. The constitutional validity of this act was challenged in the naga people's movement for human rights vs Union of India case. Five judge constitutional bench of Supreme Court of India upheld the validity of the act. And considered the real circumstances under which the armed forces have to act the Honorable Court extended the scope of the powers vested under section 4 and 6 of the AFSPA and added the power to interrogate a person arrested and retain the weapons seized. The supreme court thus did not find the powers excessive but short of what was really needed. The supreme court is the most respected institution in this country and has upheld the need and validity of this law. 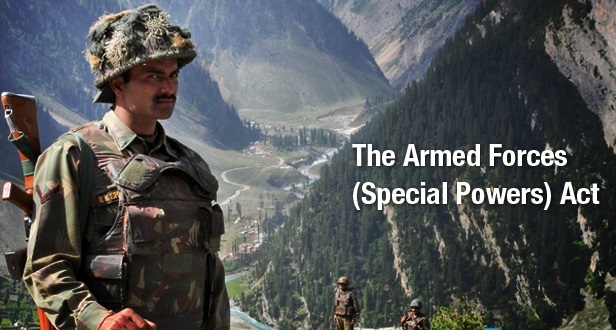 far from being Draconian, AFSPA is the bare minimum warranted in view of threat faced by security forces. The supreme court's appraisal was realistic and took note of the ground realities. It is a great pity that some foreign funded NGOs have brazenly put themselves above the supreme court of the land in demonizing the Army they are also trying to discred, it this magnificent institution in which the nation opposes so much faith. Concerted campaign to question the validity of this act and thereby delegitimize the operations of the Army. The Indian scene cannot be seen in isolation from the rest of the world. After 9/11 the US and its allies have raised a war against terror.13 International counter terrorist convention in forces ranging from hijacking piracy and intelligence sharing. The UN Security Council resolution have called for legislative reforms by countries to combat terror. These are resolution that are binding on member states. In a response democratic countries like USA UK and European Union States have enacted stringent anti terror laws to include preventive detention, control Orders and warrantless searches. After 9/11 these laws were made even more stringent and included provisions to track funds and tap phones. The US patriot law is far more stringent than AFSPA. The result is for all to see after 9/11, there has not been a second terrorist attack on the soil of Continental USA. Unfortunately in India, it has now be come commonplace for 2- 3000 citizens to perish each year at the hands of the terrorist and moist insurgents. Very surprisingly the liberal lobby in India has taken the very opposite approach while there is an outcry about the human rights of the terrorist the liberal lobby demonstrate a blase attitude towards the lives of their innocent victims Kasab and Afzal Guru are the causes celebrate Of this bleeding heart lobby. This lobby even exert pressure on the government to scrap the terrorist and disruptive activities act (TADA) and the prevention of terrorist act(POTA). The only act now remaining in the states armoury is the unlawful activities act of 1967( which needs to be greatly strengthend). Having got rid of Tada and Pota the foreign funded NGOs have set their sites on the AFSPA. There is a concerted assault upon the statesville to use legitimate forces to protect its citizens from violent armed Groups was lethality is increasing by the day, in terms of the support they get from state actors like Pakistan and China. Partial removal of AFSPA from selected districts only creates sanctuaries which the terrorist explodes To The Hilts to rest, regroup and strike again. The CM has stated that the army has not operated in Srinagar and budgam for over 3 years. This is incorrect. Is morning the Army and IT companies of CRPF sanitize the strategy Road through the city for our Logistic and ways to Kargil and Ladakh for the critical winter stocking task. Not only the road an area of nearly 3 square kilometre on either side has been to be sanitized. The airfield in Srinagar is a critical target and a 2 km zone on either and has to be sanitized to ensure that no sMS and RPGS are fired at the aircraft . Srinagar is the private of all political activities in Jammu and Kashmir all the terrorist command and control and financial networks operate from here. most intelligence even about LOC crossing is gathered in this urban centres. Premature removal of the act from These areas would be highly counter productive. In a quiet summer the state government should have consolidate its position on governance and delivery front. Unfortunately The Hunt for populist gimmicks has prompted the beleaguered state politicians to target the army in a most irresponsible manner. They have tried to manufacturer causes for the separatist to exploit. It is a tribute to the tenacity of our army that terrorism has been so drastically curtailed in Jammu and Kashmir. We have won all the battles on the ground. We should not lose the war by self inflicted goals and premature declaration for complete victory.